When used correctly an e-newsletter is a great tool for marketing. They keep your company on the minds of your customers by regularly reminding them of the services or products you offer or specials you are currently running. They can help drive more traffic to your website and improve overall conversion rates. Often though, companies miss the mark when it comes to e-newsletters by making one or more of these 5 common mistakes. Certain e-newsletter topics apply to certain people only. By separating your master email list into separate, specialized lists, you can target your e-newsletter content to the people that will be most interested. People will get to see more of what they want to see instead of something that doesn’t apply to them. 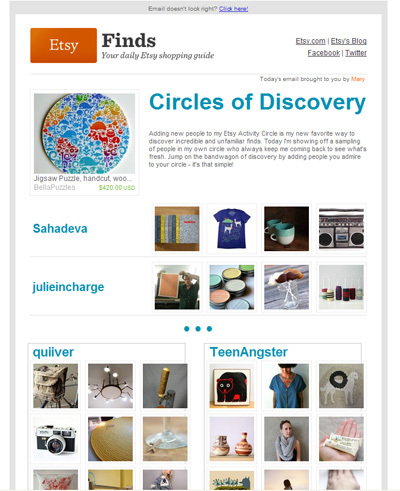 The etsy.com e-newsletter gets delivered daily. It’s important to have a schedule for your e-newsletters. Whether you send out something once a day, once a week, or once a month really depends on the type of content you offer. The important part is that you stay on schedule so your subscribers come to expect your emails. We send out our e-newsletters once a week, on Thursdays. When and how often you send your e-newsletters may be different, but you should figure out and stick to a schedule so your subscribers aren’t totally surprised when they see an email from you in their inbox. Very few people will take the time to read just text. Make your e-newsletter more engaging by using images and adding links to your website, social networks, etc. Make it look like something special instead of just a plain email. 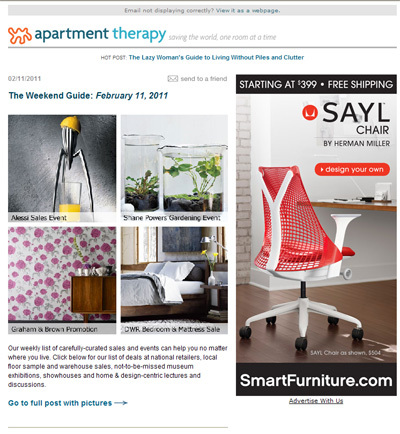 The Apartment Therapy e-newsletter is a good example of how images add interactive elements. You don’t have to go crazy and add tons of interactive elements, but just a little bit of pizzazz can go a long way. People like to talk to other people, not a company. A lot of e-newsletters make the mistake of talking from a corporate level instead of a more personal level. Let people know what is going on with your business, mention some of your projects, and make the conversation more casual. For example, we mention company news and give recommendations to different products we like in the sidebar of our weekly e-newsletter. Your subscribers will find your e-newsletter much more engaging if they feel like a person is talking to them. Some e-newsletters aren’t making the cut from a design perspective. They might not be branded to the company, use few images, or have frustrating broken links. The most effective e-newsletters have a great, functional design. 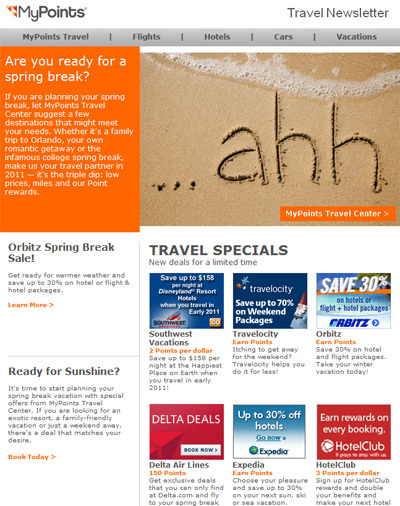 The myPoints e-newsletter is branded to look similar to their website. Just like any other type of marketing, your e-newsletter should be branded to your company. Set up a template and test out the look in as many different email platforms as you can (i.e. Outlook, Gmail, Yahoo, and Hotmail). Make sure the text is easy to read, the images display correctly and your links work. Once you have a look set, be sure to use that template whenever you send out an e-newsletter. The consistency of your design and a set schedule for sending (as mentioned above) will provide an enhanced professional image. When done right, e-newsletter can make a big marketing impact. Is your company guilty of any of the above e-newsletter mistakes? Do you have any other tips to make better use of e-newsletter marketing? Don’t forget to sign up for our company e-newsletter by clicking here.